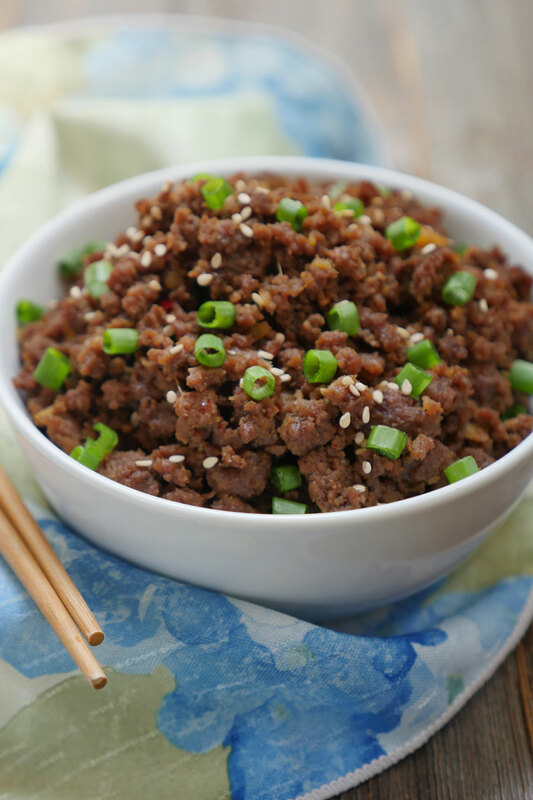 When I first posted my recipe for ground beef bulgogi, I had no idea how popular it would be! I figure that since it’s a blog reader favorite, it only makes sense for me to adapt it to be Instant Pot-friendly, so that you can have it ready to eat ASAP. For this version, I doubled the recipe. That way, I can freeze half of the bulgogi for another day. I’m all about freezing leftovers lately – it makes life so much easier! It’s one less dinner to cook/plan. I usually add fresh broccoli or green beans to the bulgogi, so if you want to, add some green veggies to the Instant Pot too. Or you can serve the bulgogi over the vegetables. 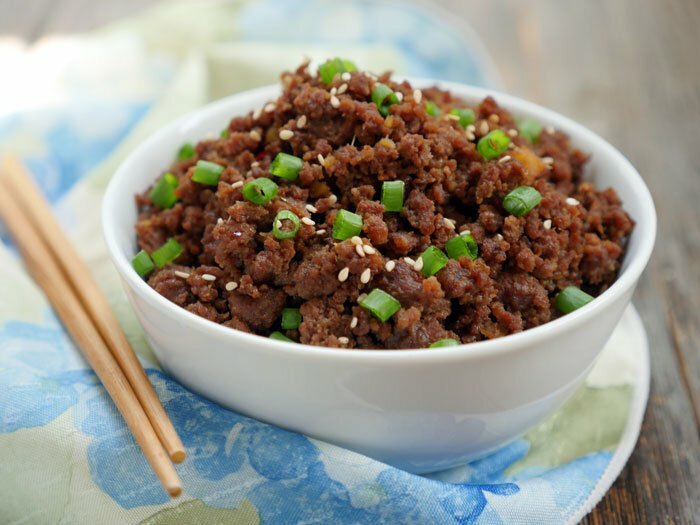 This recipe for bulgogi is much easier to make than traditional bulgogi. For starters, this recipe calls for ground beef instead of marinated grilled slices of beef. And instead of soy sauce and sugar, I’m using coconut aminos and coconut sugar. If you look at the recipe below, you’ll see the ingredients list is surprisingly short given how much flavor is in this dish! I know you’re going to love this sweet and savory recipe. It has so much umami flavor! Add the oil, garlic and ginger to the Instant Pot. Press the sauté button and sauté for 2-3 minutes. Add the ground beef to the pot and cook until mostly brown. Add the remaining ingredients to the pot and mix well. Open the valve to quick release pressure. If the meat released a lot of liquid, press the sauté button to boil off any extra liquid. Stir the green onions, sesame oil and sesame seeds into the pot and serve. This looks wonderful – I’ve never heard of Bulgogi before! I know that you have used coconut aminos and sugar but could I use normal sugar and soy sauce instead? I’m not sure if the coconut ingredients are readily available around here! Hi Lizzie! Yup, you can use regular sugar and soy sauce – you may need use a little less though. Can you please me how much for sugar and soy sauce if I can’t find the coconut stuff? Hi Ashley! 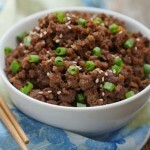 My family loves your other ground beef bulgogi recipe. I’m new to having an instant pot (Black Friday – yay!) and the few recipes I’ve made with ground beef have a different texture. Do you find this to be true as well? It’s put me off a bit wanting to try new recipes with ground beef in the instant pot. Would this work without the coconut sugar? I find aminos to be plenty sweet already. Yes, it’ll work but it won’t be as sweet. Let me know how it turns out for ya! Could we use dried ground ginger instead of fresh? If so, how much? This turned out great. It’s remarkably easy to make. I used real soy sauce – instead of aminos – and real sugar (1/4 cup white, 1/4 cup brown) – instead of coconut sugar. 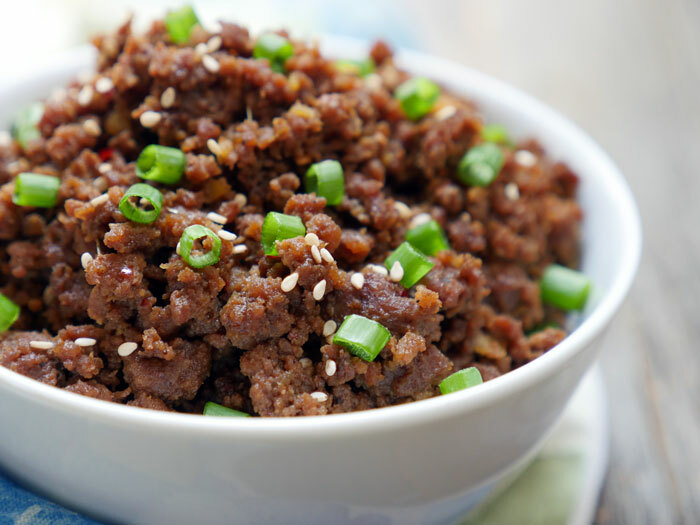 The dish has that classic Korean beef sweetness and a nice kick of spiciness. 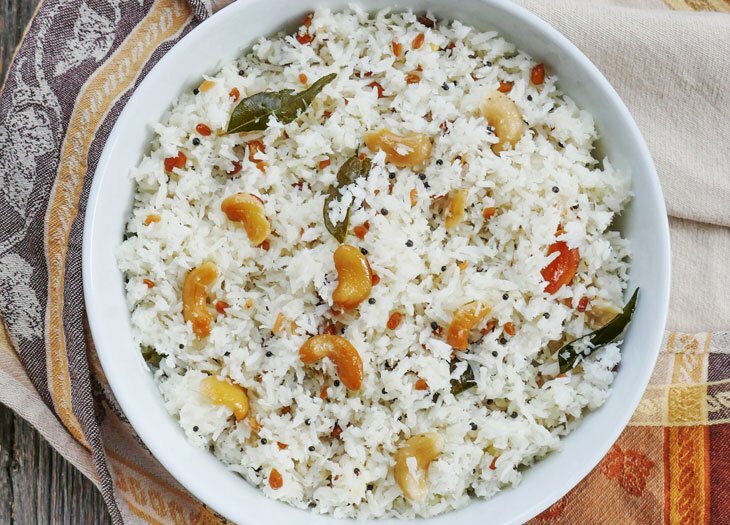 Next time I will probably reduce the amount of real sugar I used since real sugar may impart a bit more sweetness than the coconut sugar called for in this recipe. I served it up with a fried egg and steamed spinach on a bed of rice for a delicious ‘gogi-bowl and this Instant Pot dish was an “instant hit”. Glad to hear that! And thanks for sharing your subs – it’ll help other readers, I’m sure! Made this into tacos tonight with ground buffalo. Very tasty! I halved the ingredients since I only had 12oz of meat. I tried to cut back on the soy sauce but it was still salty. Next time I will use reduced sodium r coconut aminos. The hubby says that this is a keeper, next time with rice and kimchi slaw. Kit, yum! Bulgogi tacos sound amazing – will have to try that next time! And yes, soy sauce is def saltier than coconut aminos – I’ll make a note of that in the recipe for others who may not know! Was thinking to make bison burgers but bought intant pot today and am eager to try this out. Made the rice first and then I’ll do the bison. Can’t wait to try!!! This was delicious & easy to make. So happy that I have been able to find coconut amino’s here in Calgary. The flavor was so unexpected and fun to eat in lettuce wraps. This is on my go-to dishes now. Thanks for this. I will have to check your other recipes now. For my second time using my IP i googled a ground beef recipe. I never heard of Beef Bulgogi before. I was sold at no cane sugar and no soy sauce!!! But i couldn’t have known this would be so delicious!!!!! Spicy and sweet!! Just WOW! I made a tahini sauce and made lettuce wraps!! Thank you! Holly, I’m so happy to hear that you liked the recipe!! 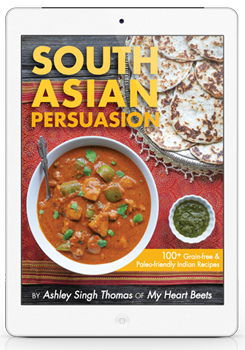 Thank you so much for letting me know how it turned out for you 🙂 And yum – will have to try it with tahini and lettuce wraps the next time I make it! Tasty. I notice this one and the stovetop recipe have the sesame oil and green onions swapped in the recipe. Is that intentional? I can’t wait to try this! Though I will most likely use Gochugaru (Korean Red Chili Flakes) and play with the traditional Asian Pear for the sweet. So happy to see this! This looks like it would be a great addition to a modified Paleo Bibimbap, but i can’t wait to try it with a lettuce wrap. I am so excited to try this recipe! If I wanted to add green beans to the instant pot, how do I do that? Do I just put it right on top of the beef? Does extra water or anything need to be added? Thanks! I think you can put them on top without extra water – let me know how it turns out for you! Did adding the broccoli to the top of the beef work for you? I made this with ground deer meat and it turned out great. IMO tho, I never cook ground meat in the IP for 30 minutes. 10 minutes is plenty. 1y2 recipe used 1/4 cup sugar and soy sauce. Instructions: Same as yours but only cook in IP for 15 minutes. My husband really loves this so the amounts above leave a lot for leftovers. Love love love this recipe! Works every time – fullproof! My family loves it and it’s ready in he time it takes me to roast some veggies, mix the salad and set the table. Thanks Ashley! Love all your recipes! Made this tonight and it was wonderful! Added broccoli at the end and served over jasmine rice. It was a hit! 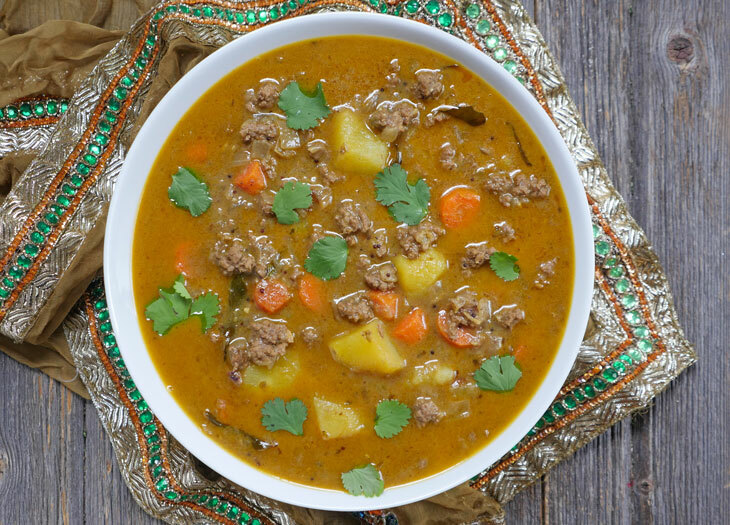 You must add more liquid to this recipe before attempting in the instant pot. As written there is not enough liquid generated to bring the pot up to pressure. Mine came up to pressure – you had trouble? I really enjoyed this recipe! Thank you for sharing! I used 1/2 cup of light soy sauce and 2 tablespoons of honey instead of coconut sugar and coconut aminos. Finally, and it’s a very minor point, the picture shows the green onions added as a garnish. When you add the green onions to the pot prior to pressure cooking, the onions shrink and become much less vibrant in color. If you want the dish to look like it does in the picture, add the green onions after cooking! I’m new to the Instant Pot, and so in this recipe, when you put the lid on, do you just leave it on saute for 10 min? Hi Konika! When you put the lid on you’ll have to switch to the pressure cook button (it may say manual or pressure cook depending on your model). If you are new to the Instant Pot then I highly suggest checking out the booklet that came with your pot as all of them are slightly different. I write my recipes so that they work with all models 🙂 Let me know if you have any more questions! I made this recipe with a few substitutions and additions and it was DELICIOUS!!! My whole family of picky eaters gobbled it up. Here’s what I changed: I used 1/2 cup low sodium soy sauce and 1/4 cup Bragg’s aminos, since I didn’t have coconut aminos or enough Braggs; I used a little less than 1/4 cup of brown sugar, since I didn’t have coconut sugar; I mixed 1 pound of ground beef and 1 pound of ground turkey (again, what I had on hand); and I added a head of chopped Napa cabbage and a small onion sliced before pressure cooking. I served it with steamed rice, sautéed green beans and mushrooms, kimchi and sriracha sauce. So yummy! Next time I will also add a fried agh. Thank you! My family and I love to this recipe. Are used a quarter of a cup of packed brown sugar and third of a cup low-sodium tamari pound it was indescribably delicious. I served on a bed of broccoli and there was more than enough for us to eat for one meal and we have plenty of leftovers it is delicious thank you for sharing. This was my first Instant Pot recipe. I had to adapt, but my husband loved it! I too was weary of too little liquid (being my first time) so I added some water (to my 2/3c soy and 1/4c sugar & 1 lb beef) but it had a little too much liquid after the 10 minutes, so I made a cornstarch slurry (2-3 tsp) and set pot to “saute” for a couple minutes–it was perfect, it kind of fried some of the meat and made a nice sauce, I will def. keep this step next time! Also topped with cilantro, green onions, sriracha (as there was not much heat in my red pepper flakes), and pistachios for crunch. I find that I only need 2-3 drops of sesame oil as mine was pretty oily to start with and it provided plenty of flavor–omitted the seeds as I didn’t have on hand. Thanks for the recipe!! Thank you – this is delicous! I only had 1 lb of ground beef, but kept the same amounts of garlic and ginger. I also didn’t have as much Coconut Aminos- so I added fish sauce and rice vinegar to get the full amount. Probably one of my all-time favorites. Excellent! How much ground ginger would you use in place of the 2-inch know of ginger? Is there a typo in this recipe in your book? It says to adjust the time in the Instant Pot to 0 minutes. On here, it says 10 minutes. I’m completely new to pressure cooking so I honesty don’t know. Super yummy and easy. I served on tortillas with fresh greens. Also I didn’t use a much a sugar as called for. Still plenty sweet. Would for sure make again! Sarah, that’s great to hear 🙂 Thanks for letting me know how it turned out for you! I’m making this for freezer meal/postpartum. Do you have any suggestions for reheating (from a cooked but frozen brick) in the IP? Sauté 5 min then pressure cook for 20 min sound good? Hi Kate! Since you’re planning to fully cook this then freeze it then you can probably just pressure cook it for 1 min to thaw the meat or you can sauté it until thawed 🙂 No need to pressure cook for that long since it’s already cooked. Congrats btw!! We make this recipe all the time now — it is a staple in our kitchen. So easy, cheap, and quick to make! And of course I always look forward to the leftovers 🙂 Thank you! Hello if I use 2lbs of ground beef – how many servings does it yield and what is a serving size? 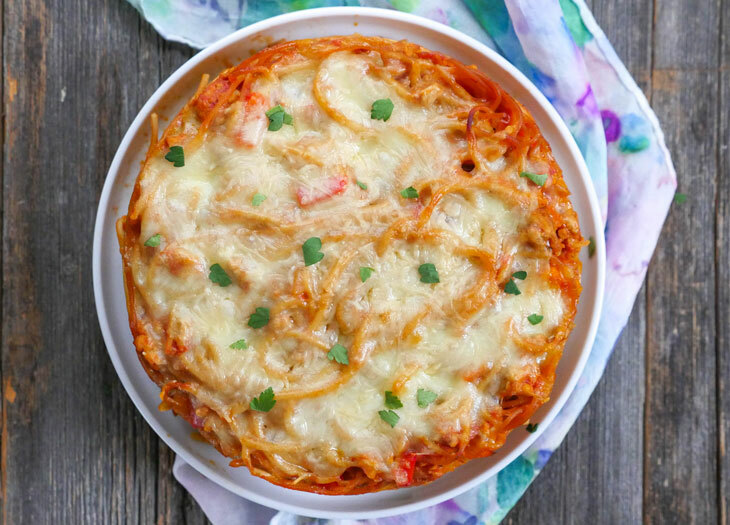 I follow weight watchers and need to track this recipe – thank you! !